A pushchair and two baby car seats sit unused in the corner of a small meeting room as members of Harrow council’s multi-agency safeguarding hub (MASH) file in for their daily morning meeting. The acronym MASH and use of the word hub can create rather grandiose ideas of what such a meeting looks like. The term can conjure images akin to the situation room from The West Wing. The reality in Harrow children’s services is, of course, very different. Here a group of six people huddle around a small grey table and run through any new referrals or changes in current cases that might cause the council concern. If it’s necessary – as it is at the end of this twenty-minute meeting reviewing two cases – a risk indicator is changed, in this case from amber to red, and a social worker from the adjacent office space is dispatched within the hour to visit the family and do an assessment. This meeting is the start to daily life safeguarding children in Harrow, a London borough in the North West of the capital. Sunny Chhetri, who leads the meeting, says it collects information “very quickly”, and the case Community Care just heard is “one of our most serious cases today”. The meeting ends with the manager of the referral and assessment team saying she will instruct a social worker to visit the child and marks the starting gun for a day filled with frantic activity as social workers, support staff and professionals from other agencies go about trying to improve the lives of children and families in Harrow. It was estimated in a 2017 Ofsted inspection that 15% of children aged under 16 living in Harrow live in low-income families, and while staff describe pockets of wealth they also see the impact of and unique challenges posed by the diversity of the community. More than two-thirds of the people who live in Harrow are from minority ethnic groups, compared to a national average of 21%, the same report said. This diversity is reflected in its workforce; people of different backgrounds fill every strategy meeting and team meeting observed. “We’ve got the largest concentration of the Hindu community [in the country],” explains Parmjit Chahal, head of service for children’s access. Child protection social workers in Harrow sit in an open plan office where the respective teams – first response, MASH, referral and assessment – communicate quickly with one another. For these social workers, days are necessarily flexible. “You can walk into work at 9 a.m. and find an email saying a child is missing from placement and hasn’t been seen since last night. And you have to act on it,” says Kerri Fox, a deputy team manager. This has happened this morning and such events mean those in the service must be prepared to think on their feet. “I’ve worked up from being a social worker here to management, and I know when you have a number of crises it seems to all happen at the same time, it can be overwhelming to prioritise and pick which one you do.” Once new cases or issues are dealt with, there’s often a flurry of activity as social workers who have had their plans changed or sped up head out to visit their clients. “You go out and it is a bit anxiety provoking,” says Faye Monteith, a social worker in the first response team who has recently finished her assessed and supported year in employment (ASYE). 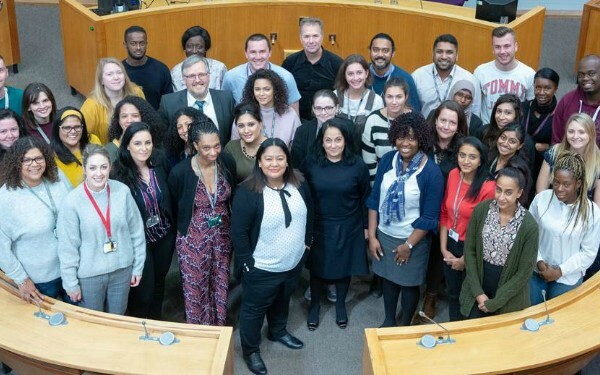 While social workers travel across the borough – driving or making use of a communal oyster card – it is incumbent on those in Harrow’s town hall to keep the service going. This might be reassigning a social worker in someone’s absence or stripping down a person’s workload. “If you’re really busy a service manager will say ‘clear your diary and focus on that, who else can help with your diary?’ You never have to deal with it yourself, you deal with it as a team,” Monteith says. That ethos is enabled by the open plan office and open-door policy of managers. Expertise can be shared, and if someone social workers need isn’t there, others can fill the gaps. “The day-to-day work we do, whether it is being a social worker or manager, has daily challenges and times when things can be stressful, and I guess it’s really important for me as someone who works in Harrow that you can speak to the person sitting next to you or your direct line manager or someone else in another team and you get somebody you can talk with, thrash ideas out, get some support,” Fox adds. Paul Hewitt, corporate director of children’s services, doesn’t mince words when talking about the reality of budget cuts on frontline social work. While the social workers who speak to Community Care say services haven’t been lost, they are seeing the complexity of cases increase as the reality of a wider net of austerity bites. Hewitt says it is necessary for the council to tackle these realities head on. He says costs are not the first things that come to social workers’ mind while working cases – and nor should it be – but Harrow has built a mantra into practice that cost is a part of care planning. “Finance is a fact of life just as it is for any family, any individual, [social workers] will need to know how much things cost,” he explains. It might cut against the ideal of what social workers want to spend their working life doing, but it is not just bean counting. It’s 2pm, and in a warm meeting room on the fourth floor of the council offices Joe, a social worker, is drawing a genogram on a large sheet of paper he has stuck to the wall. Surrounding him are the rest of his referral and assessment team pod, their manager, and an advanced practitioner. After a quiet din while Joe prepares, he outlines the case he is dealing with. A young asylum seeker, who came to the UK in 2016 from the camp at Calais, which he travelled to independently from Afghanistan, has gone missing. He was given the age of 15 by the Home Office and had been living with his uncle for two years before the relationship broke down and he was given an emergency foster care placement, outside of Harrow. He has previously attempted suicide and was detained under the Mental Health Act.He was more recently assessed by CAMHS as not experiencing any mental health disorder. Joe has been in contact with him over the several days he’s been missing, but he has been elusive about where he is and who he is with and is demanding a placement in Harrow which the council doesn’t have available at this time. The case is due to transfer at the next looked-after review in six weeks to the leaving care team. “Has anyone got any questions?” Joe finishes. The manager and advanced practitioner start by praising Joe’s work before interrogating aspects of the case, options Joe has pursued and suggestions for what could work to help this teenager respond more positively to what the council is able to provide and keep him safe. Joe’s portion of the meeting is 45 minutes and then another colleague shows one of their cases. Pod meetings where the team gets together to discuss and support one another through a challenging case are a once a week feature in Harrow. Liz Fillingham, a case manager overseeing court work, explains the value that those perspectives offers a case. “We were in a heavy strategy meeting yesterday, [about] a very vulnerable 16-year-old and what had happened to her. I was there, not in my court capacity but as a manager to the social worker, and there was a centre working with the girl there, the police. “Everyone was coming from a slightly different perspective, but we were all trying to think how it was best to move forward. What she had experienced was awful, but everybody was trying to piece together [the best way to work],” she says. A day that started with a social worker dispatched within the hour of a meeting ends as people start to follow that same journey out of the car park, only perhaps more slowly. As the social workers who speak to Community Care say, no two days are the same, and many of the staff who walked in today expecting it to go one way have had it go differently. It means long hours and can be very difficult, but this is not something people are minded to change. Fox sums up: “I look forward to coming to work even though it comes with all the challenges, and it is a job that is emotionally hard. I enjoy coming to work for seeing my colleagues, the family I work with. Everyone that populates the children’s services team at Harrow has their personal journey of what brought them here and, crucially in an environment as intense as this, what keeps them. Donna Keane’s seven-year journey to a meeting room with Community Care and a packet of biscuits in Harrow started as a social care assistant here. She’d wanted to be a social worker – and sought to pursue it on the council’s ‘grow your own scheme’ – but unfortunately that was discontinued. It is in that team where Keane sees her future. She completed her ASYE there and has been promoted to a senior social worker. “I continue to stay on the front line because I think and feel very strongly about the fact that we are very often people’s first point of contact with children’s services, and [that] needs to be positive. We need to build strong and good relationships with families where they can trust us, where we’re there to help and support them and I think that has to start from the dot,” Keane says. Relationship building isn’t easy, especially in a first response team where assessments have tight timescales before a client might cease involvement or move to another team within the service. For Keane, the key is preparation. She, and her colleagues, try not to see the short period they spend with children and families as an assessment but as a greater opportunity. “A report and assessment are an intervention in itself, and families will reflect on what you’ve written, whether they like it or not, whether they agree with it. “Our ethos is that the child should notice a difference every time you visit, that child should know that something has changed, or they have been listened to or something has been changed and understand what those changes look like. 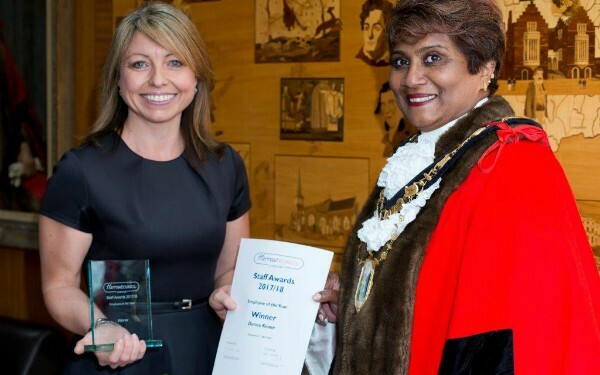 Keane’s work over the past year is what saw her recognised as Harrow’s Employee of the Year for 2018. “That was a shock, a big shock,” Keane remembers. The nicest thing about the awards, Keane explains, was not just the feedback from managers but also from service users.